Yes. 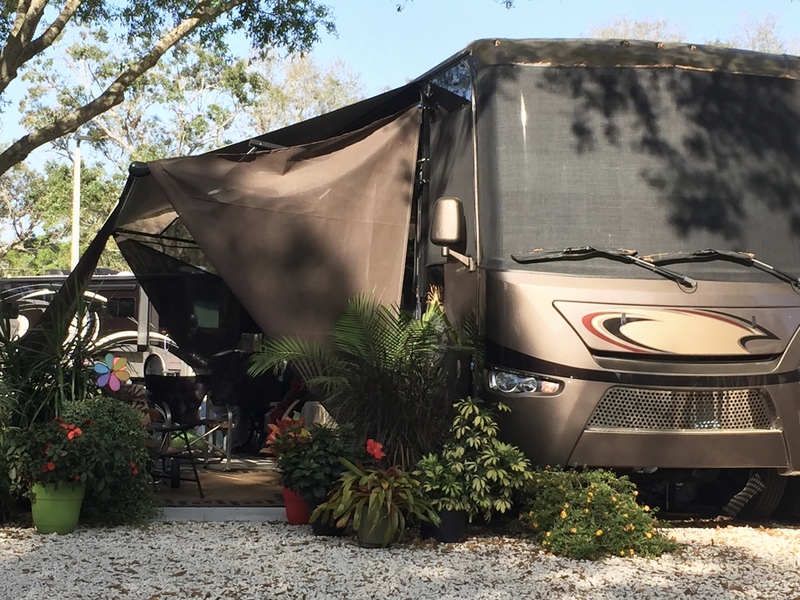 SO it took only one walk around the RV campground we stayed at on our “get some experience camping” trip to Florida before our little travel trailer lost its luster. Good grief. We are talking the Taj Mahal of camping experiences here. I realize that some of the more elaborate campsites are from snowbirds who are in it for the season. Nonetheless, the hubby and I certainly had are eyes opened to the possibilities of RV camping — if we wanted to add lots of $$$ to our trip-across-America budget. As we walked around the campground, we saw RVs with attached decks that doubled the square footage of the RV, RVs with potted plants and small gardens, and RVs with slide outs. One of the RVs had four slide outs. I can’t imagine they were doing much roughing it inside those mini-mansions. … I thought about having to drive those monsters on our trip. I am the one pulling the travel trailer, and until we left for Florida, I had 0, read that 0, experience towing anything. I found our little KZ Sportsmen Classic camper to be pretty easy for this novice to tow. Now I’m not planning on being out in rush hour traffic or driving through downtown Atlanta anytime soon, but for the 60-80 miles of driving I’ll be doing on our roads-less-traveled each day, I think I can handle it. I quickly realized that for my sanity and peace of mind, bigger is not necessarily better. a closet, and, the piéce de résistance, a bathroom with flushing toilet and shower, hallelujah! That sealed the deal for me. To that we are adding a small toaster oven for baking, a blender for making after-workout smoothies, and a Coleman stove to use outdoors to help keep the inside cleaner and cooler. Yes, at 120 sq,ft., we’re looking at a tiny space, but I prefer to call it cozy. How Mark and I will fare in this space as we already trip over each other in our smallish 2000-sq.-ft. house remains to be seen. I figure on adding to our square footage by using our outdoor attached awning and placing a nice piece of indoor/outdoor carpet underneath it with a few comfy chairs for kicking back and relaxing after we kick up some dust. Hopefully the mosquitoes will cooperate. We’ll be sure to report on the good, the bad, and the ugly as we get going. You should add a mosquito net tent to your camper! Oh! That’s a great idea! That would give us more room definitely. I am just wondering how long it would take to set up and tear down each day. Update: We ended up nixing the toaster oven and blender because space is at such a premium. May regret it, but we just don’t have the room!